Will you ever do any more ARROWSMITH comics? I really enjoyed the mini. Thank you for all the great comics you’ve written, from ASTRO CITY, AVENGERS and POWER COMPANY to THUNDERBOLTS! Carlos Pacheco and I were just talking about more ARROWSMITH the other day, Richard. And yes, we have plans for more. That’s actually the main wrinkle to the schedule I just mentioned above: On top of all that, I’m also supposed to be writing an Arrowsmith prose novel, FAR FROM THE FIELDS WE KNOW, that Carlos will be heavily illustrating. Part of cutting back on all the too-many-deadlines-at-once deal is to let me fit in some prose writing, and this is very much something I want to get back to, in between the comics deadlines. Or, if that does’nt work, we’ll carve out room for it a different way. Wish me luck! I miss The Power Company. There’s so much that could be done with it. Very glad you liked it, sir. Maybe DC’ll bring it back, at some point. I was looking over the DC Comics “New 52” solicitations I picked up at the LCBS on my weekly comic book run and I noticed you are not listed on any of the creative teams—is this an oversight on my part? I really enjoy your writing and would be disappointed to not see your talents anywhere in the DC universe. As you can tell if you’ve read this far, Adam, I’m plenty booked up with work, and most of it’s for DC. It simply isn’t stuff that’s set in the DCU (even BATMAN: CREATURE OF THE NIGHT, which features a DC character, is a non-DCU story, just as SUPERMAN: SECRET IDENTITY was). Right now, at least, that’s how I want it—after writing JLA/AVENGERS and TRINITY, I feel like I’ve scratched the itch of working with a big, sprawling shared universe, and would rather spend my time working on stuff I get to build myself. I expect that’ll change in time, but right now, it’s where I’m happiest. So I’m glad the new DCU is going over as well as it is, but I’m too busy to play at present. I really enjoyed SUPERSTAR! Keep up the good work. I have always thought that Liz was secretly in love with Peter Parker. With BND and OMIT behind us, Would you have been open to the idea for Peter to have a mutual relationship with the girl who never had the chance to date him? Wouldn’t be interesting to see Peter date a woman who is a single parent, which has never happened before in his life. This would be is a challenge that I want to see happen in a possible Liz Allen/Peter Parker relationship. It would be the first time that he would enter into uncharted territory with a woman who is a parent. It might help Peter Parker a great deal with establishing a bond of friendship with her son, Normie. I can’t really say I ever thought Liz and Peter would make a great couple, but it’s not up to me, so who knows? Marvel could certainly do it, if they like. I am a huge fan of your writing. I enjoy your KIRBY: GENESIS and of course, ASTRO CITY. I especially like Winged Victory (very few great strong women in a decent relationship) and Samaritan. Any more stories about them? As the cover I posted above would suggest, Elaine, you bet! Thanks for “Lost Boy,” in SUPERMAN 712. I did not want to post a spoiler on your Facebook fan page, but I wanted to tell you that you captured Krypto’s confusion and grief perfectly. I grieved with him as he realized what happened to Conner. You have now written two of my all-time favorite stories (“The Nearness of You” from ASTRO CITY 1/2 is the other). Very glad you liked it, Shannon. I’m glad the story finally made it into print! I heartily approve of this decision! First off, I’d like to thank you for your essay “Breaking In Without Rules” that I first read in WRITE NOW #13. I was just fresh off film school when I read it in 2006 and I can tell you your advices proved to be highly inspirational. I’m now a produced young writer (a short film broadcast several times on national television; two documentaries that I co-wrote & co-directed) and, even if a sustainable career is not promised to me yet, I just wanted you to know that your article helped me in many ways. And it continues do to so each time I re-read it! (By the way, I posted the link to it on my blog, Underscore. Now, The real subject of my e-mail. In a long interview published by THE COMICS JOURNAL, you mentioned an UNTOLD TALES OF SPIDER-MAN special written with Roger Stern, that you used to “correct” some editorial goof in the first AMAZING SPIDER-MAN annual. As a big fan of Stan Lee & Steve Ditko’s run, I’d like to know: what editorial goof were you referring to? I re-read the first Spider-Man annual several times and never found anything. It’s a very minor bit, really, so keep in mind that I didn’t write the story to “correct” that bit; we just threw it in as a minor element that eagle-eyed readers could pick up on, if they caught it, but not something that’d disturb the reading of anyone who didn’t catch it. On page 4 of the annual, Dr. Strange wanders by in his astral form, and everyone can see it, despite the fact that his astral form is invisible to normal people. But thanks to the Untold Tales special, we now know that he’d cast a spell of Spider-Man to allow him and those around him to see his astral form…and it simply hadn’t worn off yet! Secrets of the comics revealed, eh? Whenever THUNDERBOLTS comes out on new comic Wednesday I get a giddy feeling and this time I had to go back and look over the old issues. There is something great about the whole idea of it all. Characters struggling with their identity and place in the world, their urges and presumed urges… It all fits so well into a superhero comic. Just had to write you and thank you and ask: are the Thunderbolts where you would want them to be now? and most importantly, if you were writing it, would you bring back Zemo? I am about to adopt my second hairless cat and we are planning on naming him Zemo after him, oddly enough (key word oddly). I’ll confess, Eddie, the last issue of THUNDERBOLTS I’ve read was written by Fabian, so I’m not sure what they’re doing now. As I’ve mentioned before, I find it hard to read a series I wrote for a long time, because it’s hard to step out of the role of “creator” and step back into the audience. I don’t read the book like a normal reader, but like a writer, thinking, “Well, that’s not what I would have done.” And that’s not a fair reaction—and moreover, it’s a good thing that other writers don’t do what I would have done, or no one would need to hire me, would they? So in general, I don’t read books I was the writer on for an extended run. Books I created, even moreso. That’s not because I don’t think they’re well done—THUNDERBOLTS is currently written by Jeff Parker, who’s a terrific writer and a friend of mine to boot—but just because it’s hard for me to put down the puppet strings and sit back down in the audience again. That said, I’m glad you’re liking the book, and I’m very glad that something I co-created could still be running fifteen years later. Not many Marvel concepts created after, say, Wolverine and the Punisher have lasted that long, and even less stuff that debuted in the mid-1990s. So I’m proud that Mark and I could add something to the Marvel Universe and have it last this long. If I was still writing the book, I expect Zemo would be around somewhere. Not as a member of the team, but as an important player. More than that, though, I couldn’t guess. I’m not sure if this has been asked/answered before, but any plans to collect ASTRO CITY in hardcover deluxe versions a la the DC Absolute line? Not at the moment, Chris. We’re doing new editions of the existing books in hardcovers and trade paperback in newly-designed uniform editions, though. And once we’ve done those, who knows? I know this sounds surreal, but I just want to say that I have the potential to play that character very well, because I am capable of competing in the Olympics and I will have bright future in acting. I have so much potential in athletics and acting I will put my heart and soul in to it. Hopefully when do achieve that, then can we talk more I’ve also got quite abnormal background. I’m glad you like Delroy enough to want to play him on film, sir. But there’s no point in talking to me further about it. I don’t own the character or have any control over what gets done with him, in films or in the comics. He’s owned by Marvel, and they’re in complete charge of him. I want to start by saying that I absolutely love your work, particularly ASTRO CITY. It is the only comic I pick up and read as they are released. When I was younger I scoured the local used book shops and watched eBay for good deals on the trade paperbacks. After graduating college I went to Nara, Japan and taught English for 5 years. In that time I fell in love with the place. So when my contract was drawing to an end I started saving up and now am now preparing to open a rather unique business in that town, an English conversation cafe. The idea being that it will be a place for Japanese people to stop in and practice their English, relax, and enjoy a meal. To go along with that idea I decided to incorporate a large library that patrons could come and borrow books at their leisure, no purchase necessary. I’m sure you know that Japan is a culture in which graphic novels are consumed by all age groups and demographics. I found them a really useful tool in my own study of Japanese. If I didn’t understand all the words, I could gain context from the images and get a greater grasp of the material than my reading level alone supplied. I want to give this opportunity to Japanese people in their study of English. More over, I want to share my own culture’s graphic novels with them. Whoops! Sorry I was so long winded in all of that. Now I’ll get back to the point. As soon as I decided on having a graphic novel collection, the first title I decided on was ASTRO CITY. Furthermore I decided I’d like to collect the hardcover editions. I managed to collect all the books from FAMILY ALBUM through SHINING STARS (which I just read today!) easily and got a great deal on LIFE IN THE BIG CITY signed in an auction that almost slipped through the cracks on eBay. However, I’m reluctant to put that signed copy into general circulation and forever watch for a listing of the unsigned edition to come up on ebay. From what I’ve been told on other forums, there is at least a chance that this will happen. However, I have also heard that the only hardcover printing of CONFESSION (which, by the way, is my favorite story arc… wait… what about THE DARK AGE arc… what can I say, I love them all). I was disappointed to learn this. Was there a conscious decision to make the hardcover editions limited edition to reward the early fans or is there any possibility that CONFESSON would ever be re-released in hard cover, outside of the original signed run? On a non-Astro City note, another of your stories that I’ve really heard great things about, but haven’t had a chance to read is SUPERMAN: SECRET IDENTITY. I was startled to find that the trade paperback now regularly goes for $40 or more! Is there any chance of this book being reprinted too? Finally I want to thank you for everything you do. Your stories make the world a little bit better place for all those that read them and that is pretty magical. Thanks also for taking the time to read my letter. If you are ever in Nara, Japan look up my cafe (I hope to open it this year) or email me. I’d love to give you a tour of one of the most beautiful cities (well it is rather rural for a city) in the world. To answer your questions: No, there wasn’t any intent to limit the first hardcover editions—back when we were publishing through Image, the idea was that we’d do a signed first edition in hardcover, and once that sold out, we’d do an unsigned one. That’s how LIFE IN THE BIG CITY was done. Once we switched over to DC, they had different policies, and for a while we were doing signed and unsigned hardcover editions simultaneously (we’ve since dropped the signed editions). But CONFESSION came out during the transition, and would up with a signed first edition and no unsigned edition, making it the rarest of the ASTRO CITY hardcovers. However, as noted above, we’re doing new hardcover editions of all the books, so LIFE IN THE BIG CITY has already gotten a new hardcover edition, and CONFESSION will too—not right away, because we’re doing the new editions as DC runs out of existing stock of the current editions, and there’s a fair amount of CONFESSION warehoused and waiting for buyers. Once those are gone, though, there’ll be a new hardcover. As for SECRET IDENTITY, DC has as I write this reprinted the first half of the series as DC COMICS PRESENTS SUPERMAN: SECRET IDENTITY #1, and the second half will be out soon in #2. No new book edition is currently planned, but hopefully there’ll be one in time. I’m gradually changing my comic buying habits over to digital on-line purchasing wherever possible. Is ASTRO CITY available in digital form? If not, do you have any plans along those lines? What distribution model would you prefer, same day digital & paper, or delayed digital? I’m greatly looking forward to the return of the best modern-age comic by a great measure. Hopefully it’ll be soon. As I understand it, Michael, ASTRO CITY isn’t currently available digitally, but once it starts coming out again, that’ll change, and the whole back catalog will be available, as will new stuff as it comes out. I assume it’ll be available on the same “same day” basis as the rest of the DC line, which seems to be working fine. My only additional preference to that would be that I’d love for the collections to be available as digital editions as well, so readers can buy either single issues or “digital trade paperbacks,” and get the new covers, introductions and great design work that goes into those packages, too. I would first like to say thank you for being so easy to contact, since I have been dying to talk to a high-profile mainstream comic-book writer for years, but have had little luck. Most such writers have twitter accounts, but I don’t really understand how one is supposed to actually converse with another human being using an instrument that is designed specifically for publishing short pithy statements, and then reading the commennts on those statements. If I wrote “STAN LEE PLEASE GOD CALL ME” in response to one of his tweets, I doubt very much anything would come of it. I tried going to the New York comic con recently, but that was a circus where it became clear very quickly the only way I was going to be able to meet anyone I had ever read was to pay a lot of money (in advance in most instances, so I was already out of luck) and the wait in line for hours for a chance to have something signed before I was shuffled along. Maybe a smaller convention would have been better, but I am a poor college student who doesn’t have a lot of time to go chasing people across the country, just making it to New York broke me. My next thought was to just e-mail DC comics, or call them or send them a letter to have it maybe forwarded to someone, but their site does not seem to have any relevant information for contacting their writers, or even their P.R. Department. All of this is just to say that, when it finally occurred to me to google “contact Kurt Busiek” on the internet and it took my right to this page, I was incredibly relieved. So thank you again. Also, I will just say in a sentence that I think ASTRO CITY is one of the best comic book series ever written. I am a long time fan (relatively speaking) of comic books who for about five years has harbored an ambition for writing comic books. I like to think, in order to provide comfort for myself, that I have a lot in common with a past version of you in that sense. The problem of course, is that it doesn’t seem that easy to break into the industry anymore. Allow me to clarify: I like SUPERHERO comics, not independent comics nor web-comics, my sole motivating passion in the universe is to write for Green Lantern or Superman (I like Marvel, but I’m really a DC guy at heart). I have ideas for all the major players, I don’t spend a lot of time working on actual scripts because I wouldn’t know what to do with them when I was done. Several older and more level-headed people have suggested I find myself an artist (implying they grow on trees, which is not my experience but perhaps I’m not looking in the right places) and try to generate some independent appeal in the hopes of catapulting myself into greater work in the industry. But when I was at the comic-con I saw so many people trying just that without there appearing any hope that the powers-that-be noticed their existence. I am a little shocked, because while I realize that mainstream comic book publishing is a business, which measures its success in profit, it still seems like the people who write these comics must love their work enough to recognize that other people would like the chance too, and to give it to them. But it all just looks very impersonal and daunting. I realize that you possess no magical power to make my problems go away, that I could not send you a submission and expect it to end up on the desk of a major editor (so I won’t insult you by doing anything of the sort) but I was just hoping you could grant me some advice, some solace, some hope that I could make it in this industry, that I am not crazy in wanting to write something that will be read by someone with the power to make it a reality. Perhaps I’m just hoping for too big a break too fast, but damn it! if things don’t pan out for me fast I’m looking at spending the rest of my life as a school teacher, which is not a dishonorable profession, but it is one which I have no passion for, and which is the only non-creative job a liberal arts degree prepares me for. Thank you for any time you spend considering this letter. Think about it this way, Kyle: If your sole passion was to play for the Yankees, or to play James Bond in a movie, you’d still have to work your way up, right? You’d start out playing Little League, or acting in amateur or school productions, and step by step, do your best to get closer and closer to your goal. That’s what you need to do in just about any career. You wouldn’t refuse to play minor-league ball because it’s not your dream, or not bother to go to any auditions for off-Broadway shows because so few people who do that get to where you want to be. But that’s essentially what you’re doing now—you’re looking for a way to start at the top, and you’re not interested in actually practicing the skills you’d need because there’s no guarantee of success. But the thing is, those people making their own comics and selling them at conventions are closer to your dream than you are. So are the people doing independent comics and webcomics. They’re out there doing the job, learning the skills, attracting readers. Most of them probably don’t want to write GREEN LANTERN, but if they did, they’re getting the tools and experience they’d need. And they’ve got actual work to showcase their skills. If you want to write comics, you’re not going to start at the top. The editors and publishers don’t just give people a chance because they really want a chance—they hire people who’ve proved themselves, in one way or another. And none of them started at the top, either. They started wherever they could find an opening, and worked their way in. The best advice I can offer is in my essay “Breaking In Without Rules”. It may not be what you want to hear, but it’s the truth as I know it. Writing comics is a job, like writing novels, or writing for TV or movies. Most of the people who try don’t make it, but on the other hand, nobody who didn’t try makes it. Back when I broke in, nearly thirty years ago, the kind of jobs most open to newcomers were backup stories and fill-ins. And sure enough, that’s what I broke in on. But these days, there are so many publishers out there than neither Marvel nor DC looks at unsolicited submissions—they can find the writers they need by looking at the work of smaller publishers, or writers who’ve proven themselves writing TV or prose fiction. So that’s where the new writers come from, these days. So even if it’s not your dream, maybe it’s a stepping stone toward your dream. Or maybe the path to your dream is too long and risky to try it. That’s a choice you’ve got to make for yourself. It’s not easy. Neither is any job worth doing. All you can do, if you want to pursue it, is to start where you are and take whatever steps you can toward your goal. They might be small steps, and they might be hard work, but it’s the only way to get closer. Very glad to hear it, Vitor. Thanks for the note! I wanted to say that I think you have done an excellent job on your comics that I have read: ASTRO CITY, MARVELS and SUPERMAN: SECRET IDENTITY. I have referred to you as a genius for how ASTRO CITY feels like it has the continuum of DC and Marvel characters! I was also wondering something. 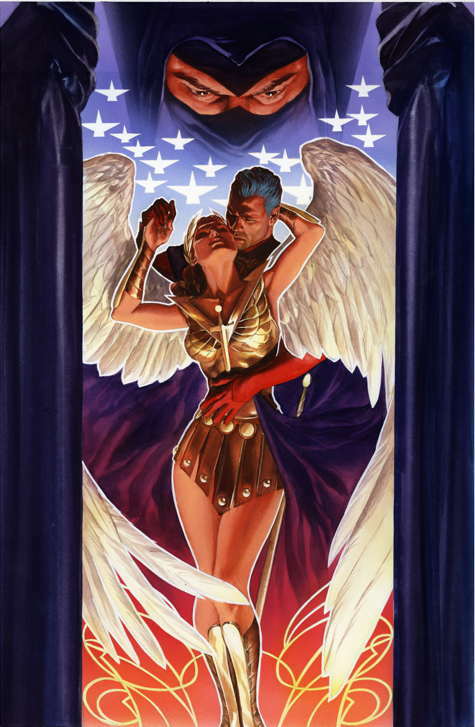 in ASTRO CITY, you portray Christianity in a positive light, particularly in CONFESSION, with the Confessor and the Crossbreed. Are you a Christian? My grandparents were all Protestant, Michael, but that’s as close to religious as I get. My parents aren’t religious, and they allowed their children to pursue their own beliefs as they saw fit. As such, one of my sisters is quite devout, but I’m thoroughly agnostic. But just because I’m not a Christian myself doesn’t mean I think all Christians are bad people, any more than I think it of Jews or Muslims or Buddhists or the followers of Odin. Or of dentists, coal miners, flight attendants or any other group I don’t happen to be a member of. So in CONFESSION, we saw a couple of examples of heroes motivated by their Christian faith to do good. I think they made for interesting characters, not often seen in comics, and I’m glad they’ve gone over as well as they have. I have a copy of VAMPIRELLA Book 2 (1991), first print copy. Where yourself, La Chance, Nyberg, Cunningham, Howell, Reyes and Kaluta did some outstanding work. My question is, there isn’t much info on it. Is it because it was a special edition? And that wraps up a long e-mail column, aside from one or two other things I’ll cover separately. Hope it’s not another six months before I blog again! This entry was posted in Mail and tagged arrowsmith, astro city, avengers forever, breaking in, kirby: genesis, krypto, milestone, new 52, power company, religion, spider-man, superman, superman: secret identity, superstar, thunderbolts, triathlon, vampirella, witchlands by Kurt Busiek. Bookmark the permalink.